Successfully Added 2 DIN Car DVD Player - For SsangYong Korando, 7 Inch HD Display, Octa-Core, GPS, WiFi, 3G&4G, Bluetooth, CAN BUS, Android 8.0 to your Shopping Cart. 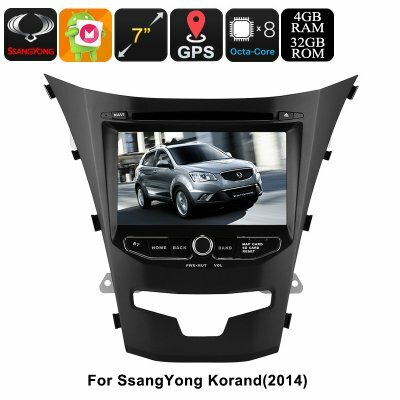 This 2-DIN car stereo is a great accessory for those of you that wish to pimp up their SsangYong Korando (model 2014). With its beautiful 7-Inch HD display, this Dual-DIN car stereo brings all the latest Android features into your car. From now on, you can entertain your kids and passengers with movies, games, and more. Access to the Play Store provides them with an abundance of free to download media to choose from. With WiFi support and 3G&4G connectivity (dongle not included), this car media player lets you browse the web, stream movies, and download Apps at any given moment. From now on, you can be guaranteed that not a single moment of boredom ever enters your vehicle again. Besides all its regular Android features, this Dual-DIN car stereo also features a DVD player. By supporting region free discs, this car DVD player is guaranteed to play all your DVDs. On its HD display, your car stereo brings forth crisp detail and stunning colors. Thanks to this, your kids will always be able to enjoy a cinematic experience from their back seat. From now on, you’ll never have to worry again about entertaining your beloved son or daughter during your upcoming road trips abroad. By packing an Octa-core processor and 4GB RAM, this cool car accessory is capable of handling all your media demands. Additionally, your car gadget can be synchronized with your iOS or Android phone through Bluetooth. When done so, you can listen to the songs stored in your mobile music library and engage in hands-free phone calls while driving your vehicle. With its 20-Channel GPS system, your car media player leads you in the fastest and most efficient way to your upcoming destinations. Therefore, you’ll never again need to worry about getting lost while driving your car. Simply insert the Android maps of your liking, and this 2 DIN car DVD player will lead the way. Besides its highly accurate GPS navigation and Android features, this car stereo naturally also supports regular FM/AM frequencies. This allows you to listen to your favorite talk shows and songs while cruising down the streets. In case you wish to enjoy your own songs, you’ll be able to do so by inserting them through the supported SD card of USB stick. Whether you use it to entertain the kids, listen to music, or find the way during your upcoming holidays – this car media player is sure to meet your demands.